This article is about the novels. For the Discworld itself, see Discworld (world). For the MUD, see Discworld MUD. For the magazine on the Apple Macintosh, see Diskworld. Forty-one Discworld novels have been published. Pratchett, who suffered from Alzheimer's disease, said that he would be happy for his daughter Rhianna to continue the series when he is no longer able to do so. However, Rhianna has stated she will only be involved in spin-offs, adaptations and tie-ins, and that there will be no more novels. The original British editions of the first 26 novels, up to Thief of Time (2001), had distinctive cover art by Josh Kirby. The American editions, published by Harper Collins, used their own cover art. Since Kirby's death in October 2001, the covers have been designed by Paul Kidby. Companion publications include eleven short stories (some only loosely related to the Discworld), four popular science books, and a number of supplementary books and reference guides. In addition, the series has been adapted for graphic novels, for the theatre, as computer and board games, as music inspired by the series, and repeatedly for television. Newly released Discworld books regularly topped The Sunday Times best-sellers list, making Pratchett the UK's best-selling author in the 1990s. Discworld novels have also won awards such as the Prometheus Award and the Carnegie Medal. In the BBC's Big Read, four Discworld novels were in the top 100, and a total of fourteen in the top 200. Very few of the Discworld novels have chapter divisions and instead feature interweaving storylines. Pratchett is quoted as saying that he "just never got into the habit of chapters", later adding that "I have to shove them in the putative YA books because my editor screams until I do". However, the first Discworld novel The Colour of Magic was divided into "books", as is Pyramids. Additionally, Going Postal and Making Money both have chapters, a prologue, an epilogue, and brief teasers of what is to come in each chapter, in the style of A. A. Milne, Jules Verne and Jerome K. Jerome. The Discworld novels contain common themes and motifs that run through the series. Fantasy clichés are parodied in many of the novels, as are various subgenres of fantasy, such as fairy tales (notably Witches Abroad), witch and vampire stories (Carpe Jugulum) and so on. Analogies of real-world issues, such as religion (Small Gods), business and politics (Making Money), are recurring themes, as are music genres such as opera (Maskerade) or rock music (Soul Music). Parodies of non-Discworld fiction also occur frequently, including Shakespeare, Beatrix Potter, and several movies. Major historical events, especially battles, are sometimes used as the basis for both trivial and key events in Discworld stories (Jingo, Pyramids), as are trends in science, technology, and pop culture (Moving Pictures, Men at Arms). There are also humanist themes in many of the Discworld novels, and a focus on critical thinking skills in the Witches and Tiffany Aching series. Rincewind was the first protagonist of Discworld; a wizard with no skill, no wizardly qualifications, and no interest in heroics. He is the archetypal coward but is constantly thrust into extremely dangerous adventures. In The Last Hero, he flatly states that he does not wish to join an expedition to explore over the edge of the Disc—but, being fully geared for the expedition at the time, clarifies by saying that any amount of protesting on his part is futile, as something will eventually occur that will bring him into the expedition anyway. As such, he not only constantly succeeds in staying alive, but also saves Discworld on several occasions, and has an instrumental role in the emergence of life on Roundworld (Science of Discworld). Other characters in the Rincewind story arc include: Cohen the Barbarian, an aging hero of the old fantasy tradition, out of touch with the modern world and still fighting despite his advanced age; Twoflower, a naive tourist from the Agatean Empire (inspired by cultures of the Far East, particularly Japan and China); and The Luggage, a magical, semi-sentient and exceptionally vicious multi-legged travelling accessory, made from sapient pearwood. Rincewind appeared in eight Discworld novels as well as the four Science of Discworld supplementary books. Death appears in every novel except The Wee Free Men and Snuff, although sometimes with only a few lines. As dictated by tradition, he is a seven-foot-tall skeleton in a black robe who sits astride a pale horse (called Binky). His dialogue is always depicted in small caps, and without quotation marks, as several characters state that Death's voice seems to arrive in their heads without actually passing through their ears as sound. As the anthropomorphic personification of death, Death has the job of guiding souls onward from this world into the next. Over millennia in the role, he has developed a fascination with humanity, even going so far as to create a house for himself in his personal dimension. Characters that often appear with Death include his butler Albert; his granddaughter Susan Sto Helit; the Death of Rats, the part of Death in charge of gathering the souls of rodents; Quoth, a talking raven (a parody of Edgar Allan Poe's "The Raven", although it flat-out refuses to say "Nevermore"); and the Auditors of Reality, personifications of the orderly physical laws and the closest thing Death has to a nemesis. Death or Susan appear as the main characters in five Discworld novels. He also appears in the short stories Death and What Comes Next, Theatre of Cruelty and Turntables of the Night. Death also appears in the non-Discworld novel Good Omens, written by Pratchett and Neil Gaiman. Witches in Pratchett's universe are largely stripped of their modern occultist associations (though Pratchett does frequently use his stories to lampoon such conceptions of witchcraft), and act as herbalists, adjudicators and wise women. That is not to say that witches on the Disc cannot use magic; they simply prefer not to, finding simple but cunningly applied psychology (often referred to as "headology", or sometimes "boffo") far more effective. The principal witch in the series is Granny Weatherwax, who at first glance seems to be a taciturn, bitter old crone, from the small mountain country of Lancre. She largely despises people but takes on the role of their healer and protector because no one else can do the job as well as she can. Her closest friend is Nanny Ogg, a jolly, personable witch with the "common touch" who enjoys a smoke and a pint of beer, often leading to her singing bawdy folk songs including the notorious "Hedgehog Song". The two take on apprentice witches, initially Magrat Garlick, then Agnes Nitt, and then Tiffany Aching, who in turn go on to become accomplished witches in their own right, and, in Magrat's case, Queen of Lancre. Other characters in the Witches series include: King Verence II of Lancre, a onetime Fool; Jason Ogg, Nanny Ogg's eldest son and local blacksmith; Shawn Ogg, Nanny's youngest son who serves as his country's entire army and civil service; and Nanny's murderous cat Greebo. The witches have appeared in numerous Discworld books, but have featured as protagonists in seven. They have also appeared in the short story "The Sea and Little Fishes". Their stories frequently draw on ancient European folklore and fairy tales, as well as parody famous works of literature, particularly by Shakespeare. The stories featuring the Ankh-Morpork City Watch are urban-set, and frequently show the clashes that result when a traditional, magically run fantasy world such as the Disc comes into contact with modern technology and civilization. They revolve around the growth of the Ankh-Morpork City Watch from a hopeless gang of three to a fully equipped and efficient police force. The stories are largely police procedurals, featuring crimes that have heavy political or societal overtones. The main character is Sam Vimes, a haggard, cynical, working-class street copper who, when we first meet him in Guards! Guards!, is the drunken/alcoholic Captain of the 2-person Night Watch: lazy, cowardly, and none-too-bright Sergeant Fred Colon, and Corporal Nobby Nobbs, a petty thief in his own right. Then Carrot Ironfoundersson, a 6-foot-6-inch-tall (1.98 m) dwarf-by-adoption, comes down from the mountains to join the Watch and do real policing. The Night Watch manages to save the city from a dragon, we learn that Carrot is possibly the rightful heir to the throne of Ankh-Morpork, and the Patrician decides to allow Vimes to create a real police force. Other main characters include Angua, a werewolf; Detritus, a troll; Reg Shoe, a zombie and Dead Rights campaigner; Cuddy, a Dwarf who appears in Men at Arms; Golem Constable Dorfl; Cheery Littlebottom, the Watch's forensics expert, who is one of the first dwarves to be openly female (and who tried to rename herself "Cheri", but without success); Sam's wife, Lady Sybil Vimes (née Ramkin); Constable Visit-the-infidel-with-explanatory-pamphlets, and Havelock Vetinari, the Patrician of Ankh-Morpork. The City Watch have starred in eight Discworld stories, and have cameoed in a number of others, including Making Money, the children's book Where's My Cow?, and the short story "Theatre of Cruelty". Pratchett stated on numerous occasions that the presence of the City Watch makes Ankh-Morpork stories 'problematic', as stories set in the city that do not directly involve Vimes and the Watch often require a Watch presence to maintain the story—at which point, it becomes a Watch story by default. The Wizards of the Unseen University (UU) have represented a strong thread through many of the Discworld novels, although the only books that they star in exclusively are The Science of the Discworld series and the novels Unseen Academicals and The Last Continent. In the early books, the faculty of UU changed frequently, as rising to the top usually involved assassination. However, with the ascension of the bombastic Mustrum Ridcully to the position of Archchancellor, the hierarchy has settled and characters have been given the chance to develop. The earlier books featuring the wizards also frequently dealt with the possible invasion of the Discworld by the creatures from the Dungeon Dimensions, Lovecraftian monsters that hunger for the magic and potential of the Discworld. The wizards of UU employ the traditional "whizz-bang" type of magic seen in Dungeons & Dragons games, but also investigate the rules and structure of magic in terms highly reminiscent of particle physics. Prominent members include Ponder Stibbons, a geeky young wizard; Hex, the Disc's first computer/semi-sentient thinking engine; the Librarian, who was turned into an orangutan by magical accident; the Dean; the Bursar; the Chair of Indefinite Studies; the Lecturer in Recent Runes; and the Senior Wrangler. In later novels, Rincewind also joins their group, while the Dean leaves to become the Archchancellor of Brazeneck College in the nearby city of Pseudopolis. The Wizards have featured prominently in nine Discworld books as well as starred in The Science of Discworld series and the short story "A Collegiate Casting-Out of Devilish Devices". Tiffany Aching is a young apprentice witch and star of a series of Discworld books aimed at young adults. Her stories often parallel mythic heroes' quests, but also deal with Tiffany's difficulties as a young girl maturing into a responsible woman. She is aided in her task by the Nac Mac Feegle, a gang of blue-tattooed, 6-inch tall, hard-drinking, loud-mouthed pictsie creatures also called "The Wee Free Men" who serve as her guardians. Both Granny Weatherwax and Nanny Ogg have also appeared in her stories. She has appeared in five novels (The Wee Free Men, A Hat Full of Sky, Wintersmith, I Shall Wear Midnight, and The Shepherd's Crown). Major characters in this series include Miss Tick, who discovered Tiffany, Annagramma Hawkin, Petulia Gristle, and Nac Mac Feegle chieftain Rob Anybody. Moist von Lipwig is a professional criminal and con man to whom Havelock Vetinari gives a "second chance" after staging his execution, recognising the advantages his jack-of-all-trades abilities would have to the development of the city. After setting him in charge of the Ankh-Morpork Post Office in Going Postal, to good result, Vetinari ordered him to clear up the city's corrupt financial sector in Making Money. A third book, Raising Steam published on 7 November 2013 features Lipwig's further exploits as a pioneer to the newly invented locomotive. Other characters in this series include Adora Belle Dearheart, Lipwig's acerbic, chain-smoking wife; Gladys, a golem who develops a strange crush on Lipwig, Stanley Howler, a mildly autistic young man who was raised by peas and becomes the Disc's first stamp collector, and the very old Junior Postman Groat, who never got promoted to Senior Postman because there was never a Postmaster alive long enough to do so. Several other books can be grouped together as "Other cultures of Discworld" books. They may contain characters or locations from other arcs, typically not as protagonist or antagonist but as a supporting character or even a throwaway reference. These include Pyramids (Djelibeybi), Small Gods (Omnia), and Monstrous Regiment (Zlobenia and Borogravia). 1 The Colour of Magic 1983 Rincewind 93rd in the Big Read. 31 Monstrous Regiment 2003 Discworld Cultures (Borogravia), The City Watch, The Ankh-Morpork Times The title is a reference to The First Blast of the Trumpet Against the Monstruous Regiment of Women; 2004 nominee for Locus Award for Best Fantasy Novel. 35 Wintersmith 2006 Tiffany Aching, The Witches The fourth YA book. Seven of the short stories or short writings were also collected in a compilation of the majority of Pratchett's known short work named Once More* With Footnotes (2004). Additionally, another short story "Turntables of the Night" (1989) is set in England but features Death as a character; it is available online and in both anthologies. Although Terry Pratchett said, "There are no maps. You can't map a sense of humour," there are four "Mapps": The Streets of Ankh-Morpork (1993), The Discworld Mapp (1995), A Tourist Guide to Lancre (1998), and Death's Domain (1999). The first two were drawn by Stephen Player, based on plans by Pratchett and Stephen Briggs, the third is a collaboration between Briggs and Kidby, and the last is by Paul Kidby. All also contain booklets written by Pratchett and Briggs. Several Discworld locations have been twinned with real world towns and cities. Wincanton, in Somerset, UK, for example is twinned with Ankh-Morpork, and the town is the first to name streets after their fictional equivalents. Most years see the release of a Discworld Diary and Discworld Calendar, both usually following a particular theme. The diaries feature background information about their themes. Some topics are later used in the series; the character of Miss Alice Band first appeared in the Assassins' Guild Yearbook, for example. The Discworld Almanak – The Year of The Prawn has a similar format and general contents to the diaries. The Josh Kirby Discworld Portfolio (1993) A collection of Josh Kirby's artwork, published by Paper Tiger. The Discworld Companion (1994) An encyclopaedia of Discworld information, compiled by Pratchett and Briggs. An updated version was released in 2003, titled The New Discworld Companion. A further updated version was released in 2012, titled Turtle Recall: The Discworld Companion . . . So Far. The Discworld Portfolio (1996) A collection of Paul Kidby's artwork, with notes by Pratchett. Nanny Ogg's Cookbook (2002) A collection of Discworld recipes, combined with etiquette, language of flowers etc., written by Pratchett with Stephen Briggs and Tina Hannan. The Art of Discworld (2004) Another collection of Paul Kidby's art. The Discworld Almanak (2004) An almanac for the Discworld year, in the style of the Diaries and the Cookbook, written by Pratchett with Bernard Pearson. The Unseen University Cut Out Book (2006) Build your own Unseen University, written by Pratchett with Alan Batley and Bernard Pearson, published 1 October 2006. Wit and Wisdom of Discworld (2007) A collection of quotations from the series. The Folklore of Discworld (2008) A collaboration with British folklorist Jacqueline Simpson, discussing the myths and folklore used in Discworld. The World of Poo (2012) Another in-universe children's book (similar to Where's My Cow), referenced in Snuff. The books take place roughly in real time and the characters' ages change to reflect the passing of years. The meetings of various characters from different narrative threads (e.g., Ridcully and Granny Weatherwax in Lords and Ladies, Rincewind and Carrot in The Last Hero) indicate that all the main storylines take place around the same period of time (end of the Century of the Fruitbat, beginning of the Century of the Anchovy). Thus, it could be seen that some of the separate books run concurrently rather than consecutively. The main exception to this rule is the stand-alone book Small Gods, which appears to take place at some point earlier than most of the other stories, though even this contains cameo appearances by Death and the Librarian. Some main characters may make cameo appearances in other books where they are not the primary focus; for example, City Watch members Carrot Ironfoundersson and Angua appear briefly in Going Postal, Making Money, and Unseen Academicals (placing those books after Guards! Guards! and Men at Arms). A number of characters, such as members of staff of Unseen University and Lord Vetinari, appear prominently in many different storylines without having specific storylines of their own. Most of Pratchett's novels have been released as audio cassette and CD audiobooks. Unabridged recordings of books 1–23 in the above list, except for books 3, 6 and 9, are read by Nigel Planer. Books 3 and 6 are read by Celia Imrie. Book 9 and most of the books from 24 onward are read by Stephen Briggs. Abridged versions are read by Tony Robinson. Fantastic Audio also recorded two Discworld novels: Thief of Time and Night Watch. The Colour of Magic, The Light Fantastic, Mort, and Guards! Guards!, and Small Gods have been adapted into graphic novels. Due in part to the complexity of the novels, Discworld has been difficult to adapt to film – Pratchett was fond of an anecdote of a producer attempting to pitch an adaptation of Mort in the early 1990s but was told to "lose the Death angle" by US backers. Welcome to the Discworld – an 8-minute animated television adaptation of a fragment of Reaper Man filmed by Cosgrove Hall before the TV series. Soul Music – Starring Christopher Lee as Death, also featuring Neil Morrissey and Graham Crowden. First episode broadcast on 18 May 1997. The soundtrack to Soul Music was also released on CD. Wyrd Sisters – Starring Christopher Lee as Death, also featuring Annette Crosbie, June Whitfield, Jane Horrocks and Les Dennis. First episode broadcast on 28 December 1998. Mort (2001): A fan movie adaptation of the eponymous novel by Orange Cow Production, 26 minutes. Lords and Ladies (2005): A fan movie adaptation of Lords and Ladies by Almost No Budget Films was completed in Germany. Terry Pratchett's Hogfather (2006): In the UK, Sky One commissioned a £6 million 'made for television' adaptation of Hogfather with David Jason playing the role of Albert. It was first broadcast in December 2006 and features Terry Pratchett in a brief cameo role as the Toymaker. Run Rincewind Run! (2007): A Snowgum Films original story created for Nullus Anxietas. Stars Troy Larkin as Rincewind, and features Terry Pratchett as himself. Terry Pratchett's The Colour of Magic (2008; based on both The Colour of Magic and The Light Fantastic): David Jason played 'Rincewind'. This adaptation aired in the UK over Easter 2008 and also features Terry Pratchett in a brief cameo role as an Astrozoologist. Terry Pratchett's Going Postal (airdate May 2010), produced by Sky1. It stars Richard Coyle, David Suchet, Charles Dance, Claire Foy, Steve Pemberton, Andrew Sachs and Tamsin Greig. Terry Pratchett appears in a cameo role as a postman. Troll Bridge: Australian group Snowgum Films is working on animated film as of 2016. The Wee Free Men: In January 2006, it was announced that Sam Raimi would direct an adaptation of The Wee Free Men for Sony Pictures; Terry Pratchett did not like the script. On 1 November 2013, Rhianna Pratchett announced on Twitter that she was adapting The Wee Free Men into a feature-length film. In 2016 Narrativia confirmed the film would be co-produced with The Jim Henson Company. The Watch: Pratchett's daughter, Rhianna, announced in August 2012 a new production company, Narrativia, and said it would produce a TV series based on the Ankh-Morpork City Watch. The show has not been released as of 2016. Eric (1990), a 4-part dramatised adaptation began airing on BBC Radio 4 on 6 March 2013. Stephen Briggs published stage adaptations of 18 Discworld novels. Most of them were first produced by the Studio Theatre Club in Abingdon, Oxfordshire. They include adaptations of The Truth, Maskerade, Mort, Wyrd Sisters and Guards! Guards! Irana Brown directed her adaptation of Lords and Ladies, first performed in 1995 at the Winton Studio Theatre. Her adaptation was published in 2001 by Samuel French, and is still being performed as of 2016. A stage version of Eric, adapted by Scott Harrison and Lee Harris, was produced and performed by The Dreaming Theatre Company in July 2003 inside Clifford's Tower, the 700-year-old castle keep in York. It was revived in 2004 in a tour of England, along with Robert Rankin's The Antipope. Small Gods was adapted for the stage by Ben Saunders and was performed in February 2011 at the Assembly Rooms Theatre, Durham by Ooook! Productions and members of Durham Student Theatre. Ooook! Productions also adapted and staged Terry Pratchett's Night Watch (February 2012), Thief of Time (February 2013; adapted by Tim Foster), Lords and Ladies (February 2014, adapted by Irana Brown), Monstrous Regiment (2015), and Soul Music (February 2016; adapted by Imogen Eddleston). A stage version of Monstrous Regiment was produced by Lifeline Theatre in Chicago, Illinois in June, July, and August 2014 with an adaptation written by one of Lifeline's ensemble members, Chris Hainsworth. Various other types of related merchandise have been produced by cottage industries with an interest in the books, including Stephen Briggs, Bernard Pearson, Bonsai Trading, Paul Kidby and Clarecraft. The board game Thud (2002) was created by puzzle compiler Trevor Truran. Guards! Guards! A Discworld Boardgame (2011) was created by designers Leonard Boyd & David Brashaw (Backspindle Games) and published by Z-Man Games. The first copies went on sale on 8 July 2011 at the North American Discworld Convention, exactly 20 years after Leonard had conceived the first draft in 1991. The box cover and 90 Discworld character cards were illustrated by Stephen Player. Discworld: Ankh-Morpork (2011) was designed by Martin Wallace and released by Treefrog Games in three different editions, each with different content and different game boards; the collectible editions also have different numbering system (the number 8 is replaced by 7a). A follow-up game called The Witches, also by Wallace, was released by Treefrog in September 2013. The card game Cripple Mr Onion is adapted from the novels. A selection of figures has been produced by Micro Art Studio. Dave Greenslade: Terry Pratchett's From the Discworld (1994; Virgin CDV 2738.7243 8 39512 2 2). Keith Hopwood: Soul Music — Terry Pratchett's Discworld, (1998; Proper Music Distribution / Pluto Music TH 030746), soundtrack to the animated adaptation of Soul Music. ↑ "Sir Terry Pratchett". Amazon. Retrieved 18 May 2012. ↑ "Terry and Rob". Twitter. Retrieved 24 November 2013. ↑ "Terry Pratchett: My daughter Rhianna will take over the Discworld when I'm gone". New Statesman. 14 November 2012. Retrieved 14 November 2012. ↑ "Terry Pratchett's Discworld series is definitely over as daughter Rhianna rules out future books". The Independent. 12 June 2015. ↑ Terry Pratchett (30 July 1992). "Chapters". Newsgroup: alt.fan.pratchett. Usenet: memo.550062@cix.compulink.co.uk. Retrieved 9 June 2007. ↑ Terry Pratchett (26 September 1993). "Re: Posting to TP". Newsgroup: alt.fan.pratchett. Usenet: 749073107snz@unseen.demon.co.uk. Retrieved 9 June 2007. ↑ "1989 Award Winners & Nominees". Worlds Without End. Retrieved 29 June 2009. ↑ "1997 Award Winners & Nominees". Worlds Without End. Retrieved 29 June 2009. ↑ "2000 Award Winners & Nominees". Worlds Without End. Retrieved 29 June 2009. ↑ "2002 Award Winners & Nominees". Worlds Without End. Retrieved 29 June 2009. ↑ "2003 Award Winners & Nominees". Worlds Without End. Retrieved 29 June 2009. ↑ "',Monstrous Regiment', annotations at". Lspace.org. Retrieved 29 August 2009. ↑ "2004 Award Winners & Nominees". Worlds Without End. Retrieved 28 September 2009. ↑ "2005 Award Winners & Nominees". Worlds Without End. Retrieved 29 June 2009. ↑ "2006 Award Winners & Nominees". Worlds Without End. Retrieved 29 June 2009. ↑ "2008 Award Winners & Nominees". Worlds Without End. Retrieved 29 June 2009. ↑ "Discworld News August 2009 PJSM Prints". Paulkidby.com. 22 August 2009. Retrieved 29 August 2009. ↑ "2010 Nebula Awards Winners", Locus Online, 21 May 2011, accessed 22 May 2011. ↑ "Snuff –third fastest selling novel since records began!". Terry Pratchett. 2011-10-30. Retrieved 2011-11-23. ↑ "The Fifth Tiffany Aching Novel Announced". Terry Pratchett Books. 11 August 2014. Retrieved 16 August 2014. ↑ "Petition asks Death to bring Sir Terry Pratchett back". ↑ "Troll Bridge". Members.fortunecity.com. Archived from the original on 2012-03-09. Retrieved 9 March 2012. ↑ "A Collegiate Casting-Out of Devilish Devices". Loki.ovh.org. Retrieved 29 August 2009. ↑ Kehe, Jason (12 March 2015). "Remembering Terry Pratchett, a Fantasy Icon". Wired. Retrieved 13 August 2015. ↑ Shan, Darren (26 November 2012). "TURTLE RECALL: The Discworld Companion . . . So Far | Ynci the Short-Tempered". Gollancz Blog. Retrieved 31 May 2013. ↑ "The Compleat Ankh-Morpork: City Guide". Good Reads. Retrieved 2 August 2013. 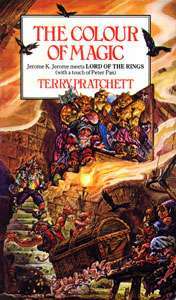 ↑ "Mrs Bradshaw's Handbook (Discworld): Amazon.co.uk: Terry Pratchett: 9780857522436: Books". ↑ "The Discworld Atlas (Discworld): Amazon.co.uk: Terry Pratchett: 9780857521309: Books". ↑ "The Colour of Magic". Comic Vine. Retrieved 4 September 2016. ↑ "Mort (1994)". Comic Book DB. Retrieved 4 September 2016. ↑ "Guards! Guards! (2000)". Comic Book DB. Retrieved 4 September 2016. ↑ Pratchett, Terry (21 January 2016). "Something very much to look forward to on 14th July 2016 #smallgodsgraphicnovel @raisegrate". Twitter. Retrieved 4 September 2016. ↑ Terry Pratchett (2 November 1992). "DW Film... (was Re: Guards! Guards! play". Newsgroup: alt.fan.pratchett. Usenet: memo.725659@cix.compulink.co.uk. Retrieved 9 June 2007. ↑ "Mort – Orange Cow Productions Motion Picture Studio". ↑ "Lords and Ladies fan movie adaptation". ↑ "More Adaptations by Sky to follow". ↑ "Hogfather (TV Movie 2006) – Full Cast & Crew – IMDb". Uk.imdb.com. 2009-05-01. Retrieved 2014-08-18. ↑ "Raimi's a Free Man, Spidey helmer signs for new flick". IGN. 10 January 2006. ↑ "Sam Raimi set to direct The Wee Free Men". 10 January 2006. ↑ Pratchett, Rhianna. "Crivens! Sorry, should've been clearer. I'm adapting Wee Free Men into a feature length movie.". Twitter. Retrieved 1 November 2013. ↑ Pratchett, Rhianna (27 August 2012). "Announcing the birth of Narrativia – a production company run by myself, Rod Brown & @terryandrob. First up are Good Omens & The Watch". Twitter. Retrieved 9 September 2012. ↑ Pratchett, Rhianna (29 August 2012). "@thebitterguy @terryandrob Good Omens will be a TV movie & The Watch is planned as a 13-part TV series". Twitter. Retrieved 9 September 2012. ↑ "BBC Radio 4 Extra – Terry Pratchett, Eric, Episode 1". Bbc.co.uk. 2013-03-06. Retrieved 2014-08-18. ↑ "BBC Radio 4 - Terry Pratchett, Guards! Guards!, Episode 1". BBC. ↑ "BBC Radio 4 - Terry Pratchett, Mort, Episode 1". BBC. ↑ "BBC Radio 4 Extra - Terry Pratchett, Night Watch, Episode 1". BBC. ↑ "BBC Radio 4 - Terry Pratchett, Small Gods, Episode 1". BBC. ↑ "BBC Radio 4 - Terry Pratchett, Wyrd Sisters, Episode 1". BBC. ↑ "Lifeline Theatre :: Monstrous Regiment". ↑ "Discworld game pratchett Guards! Guards! City WatchGuards Guards Boardgame". Guardsguards.com. Retrieved 2014-08-18. ↑ "Ankh-Morpork Discworld Boardgame". Treefrog Games. ↑ "The Witches « Treefrog Games". Treefroggames.com. Retrieved 2014-08-18. ↑ "Micro Art Studio". Retrieved 23 December 2013. ↑ "page". Amazon.co.uk. Retrieved 29 August 2009. Discworld Covers Wiki Book covers collection from all over the world. Discworld Monthly monthly email newsletter / website about Terry Pratchett and Discworld. Discworld reading order - A guide to the different story arcs.